Tickets are available locally at Recycled Records (S Virginia) and the Cargo box office (inside Whitney Peak). 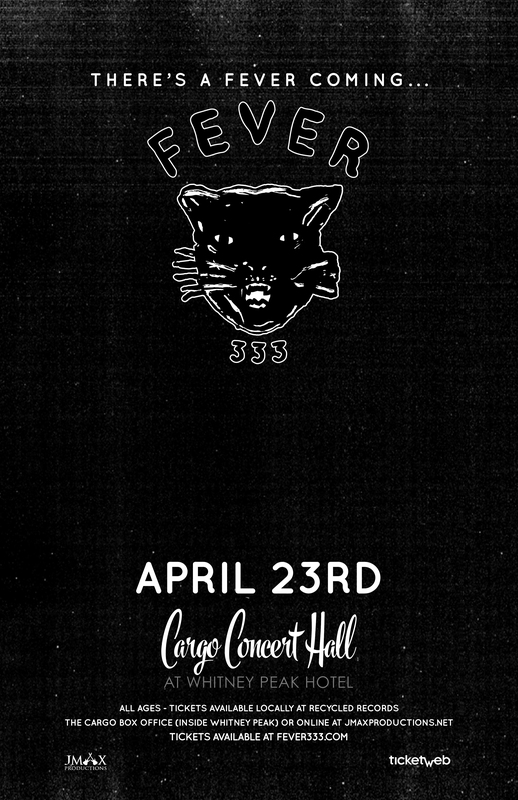 Los Angeles-based trio FEVER 333 inject their raucous hybrid rap-rock sound with politically charged lyrics similar to forebears Rage Against the Machine, with additional touches of Public Enemy, Black Flag, and Linkin Park. Abrasive, aggressive, and energetic, the three-piece outfit features frontman Jason Aalon Butler (ex-LetLive), guitarist Stephen Harrison (the Chariot), and drummer Aric Improta (Night Verses). With full support by producers Travis Barker (blink-182) and John Feldmann (Goldfinger) -- who signed the band to their More Hi-Hat label -- FEVER 333 made their debut in 2017 with fiery live shows and grassroots organization to promote their message of "community, charity, and change." This socially conscious spirit was woven into early tracks like the visceral "Hunting Season," the genre-blurring trap-metal "Walking in My Shoes," and the fiery "We're Coming In." In March 2018, the band announced that they had inked a deal with Roadrunner Records, releasing the EP Made in America. Strength in Numb333rs, the group's first full-length effort, arrived in early 2019.